The AcoustiKit provides all the basic elements necessary to treat a small mixing room with dimensions up to 10' x 14'. Installation instructions and plans for room layout are included. The design of this rigid acoustical panel system allows you to customize your sound control application. These Paintable / Printable panels, with unlimited design potential, are currently available from stock and ready to ship. Designed for controlling low frequency sound, these custom manufactured, large foam wedges are used to create acoustic test chambers with no sound reflections. Both visually striking and highly effective, these diffusers are suitable for use in recording, broadcast, theater, home listening rooms, offices or anywhere diffusion is required. ArtDiffusor® Trim combines a beautiful, versatile building material with a high-frequency quadratic diffuser. Two unique profiles to mix and match! Build a better sounding space! Designed to be mounted in room corners, these are easily the most budget-friendly choice for controlling unwanted bass at the intersection of walls. This mass loaded vinyl (MLV) product is the number one choice for blocking unwanted airborne sound transmission through walls, floors and ceilings. BlockAid is great for new construction or for retrofits to existing facilities. These light-weight ceiling treatments are ideal for reducing unwanted reverberation in larger areas such as gymnasiums, theaters, restaurants and multi purpose rooms. A quick and easy sound solution for reducing the volume of sound in offices or in any standard drop-tile ceiling grid. These acoustic tiles can also be mounted directly to surfaces and are available in a variety of patterns to create visual interest. 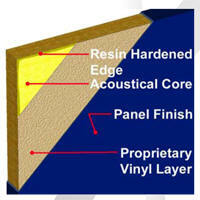 Composite Foam combines a noise barrier and isolating foam de-coupler with a highly absorptive surface layer. It is used to control both noise penetration and sound reflection. Our premium quality sound absorbing acoustical foam. Cutting Wedge can be installed to create a seamless wall. With the use of Cutting Wedge 2000, you have the option to add additional layers of absorption as needed to increase absorption and bass response. Stackable Acoustical Foam - other foams don't stack up! This tried and true poly-cylindrical diffuser design will scatter sound in the mid to upper frequencies while acting as a bass trap below 500 Hz. Ideal for a variety of applications from control rooms to concert halls. A light weight, yet durable acoustical panel ideal when custom sizes or field modifications are required. Made from FireFlex foam faced with a high performance fabric, this product can also be applied to curved surfaces. The best choice for controlling structural and impact noise which can be problematic in floors. Constructed from a high density foam de-coupler bonded to a flexible noise barrier, this product will also block sound. These Class 1 foams are uniquely suited for environments where temperatures are high or a fireproof material is required. Available in variety of shapes and sizes, FireFlex installs easily to handle tough noise problems. These curved, fabric wrapped sound absorbing units can be applied to walls, corners and where ceilings intersect. Available as quarter-rounds or half-rounds, Geometrix demonstrate outstanding performance in all frequency ranges. Guilford of Maine Fabrics are used to cover many of our products, including wall panels, diffusers and corner traps. We also offer these fabrics separately for a variety of applications, including speaker grill cloth. The patented HiPer Panel, or flat panel diffuser, combines sound absorption and diffusion into one device. Use this when a low profile diffuser is required or when diffusion will be mixed with standard fabric wrapped acoustical panels. Isolation Hangers are used to absorb vibration energy and prevent the structural transmission of sound. They are great for hanging speaker enclosures or de-coupling ceiling grids. This low frequency panel provides low frequency control without over-absorbing high frequency energy while trapping bass with its flexible-membrane facing. The most cost effective sound absorbing acoustic material. 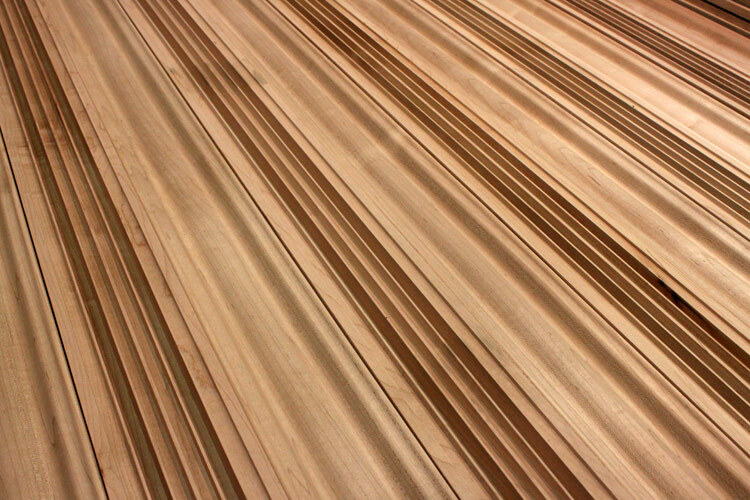 These acoustical foams are available in a wide variety of colors, patterns and thicknesses to suit any need. A traditional industry workhorse, this diffuser disperses sound uniformly over a broad frequency range. A quick and easy solution to reduce flutter echo and maintain a warm room sound. This modern design is our own unique take on a traditional Pyramidal Diffuser. These low profile units are economical, easy to install on the wall or in ceiling grids. This patented pattern has four pre-rotated quadrants within a single 2' x 2' unit, saving valuable time. Quadratic Diffuser - Model "Q"
A true quadratic residue diffuser designed for uniform broadband scattering and reduction of High-Q reflections. Quiet Louvers are appropriate anywhere sound absorption is required and the warmth of wood is desired. The wooden louvers overlap the panel's seams leaving the final installation with a clean monolithic look. Resilient clips, used in conjunction with furring channels and hat tracks, reduce impact noise and sound transmission in most ceiling and wall constructions. Using Resilient Clips along with BlockAid Sound Barrier will yield optimal sound reduction. This acoustical picture panel combines sound absorption with customer provided artwork or images. Its glass fiber core ensures superior sound control while custom printed graphics enhance visual appearance. These fabric wrapped acoustical panels are an industry standard for absorbing sound and reducing echo. In addition to the wall panels, there are a variety of configurations for ceilings including hanging baffles, ceiling clouds and drop-in tiles for t-bar grids. Additionally, these panels can be custom manufactured with High Impact or Tackable facings, in custom sizes and covered with many different types of fabrics to meet the needs of the application or its decor. This absorptive wall covering for vertical surfaces offers unmatched fade resistance, a fire rating of Class-A and is available in dozens of colors. A great choice for treating large surface areas in schools, offices or anywhere that speech intelligibility is critical. This free standing acoustical foam sound absorber is used to create temporary vocal booth or mixing area. Simply slide the Sound Cylinder onto a studio microphone stand. StratiQuilt quilted fiberglass blankets provide effective, abuse resistant, sound absorption and noise isolation for industrial applications, theater and television sound stages. The Transfusor is a translucent version of the Art Diffusor, available as either Model C or Model F. It can be used for natural skylight, ceiling light cover or backlit for visual effects. VibDamp is a visco-elastic material applied directly to a surface, particularly metal, to reduce noise. It will dampen wall "ringing" and equipment cabinet rack panel "singing." Vib-X Pad absorbs vibration energy and prevents the transmission of shock or vibration from one surface to another surface. Vib-X Pad may be used to mount noisy machinery or to attach an independent floating stud wall or floor for room-within-a-room isolation. Contact Us for any other acoustical products not listed above.